GW170817: The X-Ray Emission Did What? In August 2017, gravitational waves from a binary neutron star merger (GW170817) were detected for the first time ever by LIGO and Virgo. Also detected were (deep breath recommended) — gamma-ray, X-ray, ultraviolet, optical, infrared, and radio waves — all from the same source. The era of multi-messenger astronomy was thus kicked off in spectacular fashion. 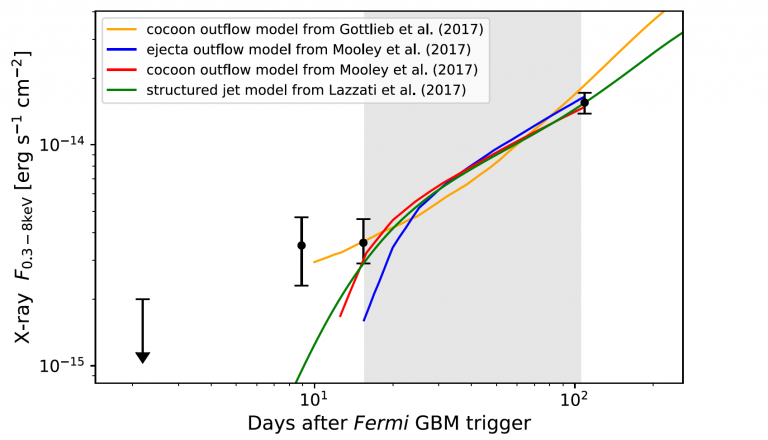 The coincident short gamma-ray burst (GRB 170817A) confirmed that merging neutron stars are indeed one of the progenitors of short GRBs. Read this astrobite for more details about these observations. Today’s bite further illustrates why multi-messengers are so very important and exciting. It is not entirely clear what happened after the merger, and complementary information from different channels can help construct an accurate picture. The optical signal, for example, may carry slightly different information about the source than the radio waves do. So, if we manage to detect both, we end up with an additional clue about whatever produced them! Here, we will discuss the X-ray observations of GW170817/GRB 170817A. When the Chandra X-ray observatory followed up the optical counterpart of GW170817 at ~2 days post-burst, no X-ray counterpart was detected. The X-rays did show up eventually, at ~9 days post-burst. This delayed brightening is quite unusual — standard GRB afterglows show dimming instead. Additional observations at ~15 and 16 days also showed no significant dimming. Then, because of sky proximity of the source to the Sun, sensitive X-ray monitoring was not possible until December 2017. Today’s paper presents Chandra observations at 109.2 days post-burst, immediately after constraints from the Sun were lifted. The X-ray flux of GRB 170817A has brightened significantly, with a count rate ~4 times larger than the previous detection at 15.6 days. Figure 1 shows the X-ray image at 109.2 days post-burst, alongside the one at 15.6 days post-burst, clearly showing the source get brighter. The spectra can be found in Figure 2 in the paper. As it turns out, radio observations of this source have also reported monotonically brightening emission. Comparing the X-ray fluxes to radio reveals that they are brightening at a similar rate. This points to a common origin for these two messengers! But what does all this mean for the post-merger scenario? Remember, what happened after the merger is not a settled question, but it’s really interesting if we want to study physics under some pretty extreme conditions. Let’s explore three post-merger narratives and how well they can predict the X-ray and radio light curves that were observed. You can also read more about GRBs, jets and afterglows here, here and here before diving in. Model 1: A uniform (“top-hat”) jet, seen off-axis. Radio light curves do not support this model since the brightening occurs at a slower rate than predicted. The same goes for the X-ray observations. Model 2: A structured jet, seen off-axis. A structured jet that breaks out of the surrounding material (ejected during the merger) can predict X-ray and radio light curves that are a good match. When the jet is observed off-axis, a slowly brightening afterglow is seen, coming from increasingly relativistic material closer to the jet axis. Model 3: Afterglow of an outflow. In this model, an observable jet that breaks out is not required or favored. An outflow that injects energy into the shock continuously can produce a slow, monotonic rise of the afterglow emission. The outflow can either be a cocoon of material shocked by the jet, or a high-velocity tail of the dynamical ejecta from the merger. 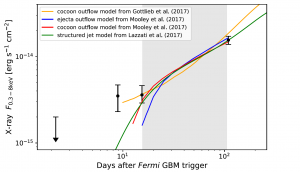 Figure 2 shows the Chandra X-ray light curve of GRB 170817A, along with predictions from structured-jet, cocoon and ejecta-outflow models. Note that the early-time X-ray flux is underpredicted. However, these models were fitted to the radio light curve, which does not cover early times. A complete fit would need to include the X-ray data as well. The X-ray observations disfavor simple top-hat jets and support the scenario where both the X-ray and radio emissions are the afterglow of an outflow or structured jet. Continued monitoring will provide even more information for constraining post-merger models. Stay tuned! I’m a grad student at North Carolina State University. I’m interested in extreme astrophysical events like core-collapse supernovae and compact object mergers.